 Ou Atlas topographique et statistique du plan géométral de la ville de Paris, avec le tracé des alignemens arrêtés par le Gouvernment. An early pocket street atlas covering the whole of Paris, published in 1813. The 20 sheets of the atlas have been merged to give a continuous image. The data has been processed to squeeze the file size down to 2 megabytes. Map image is 2300x1900 pixels. Use buttons to select: Title Page, Index Page or Map. Click on any image to return to this page.